Sunreed Instruments™, LLC, is Your Source for Sound Healing™. We are experts in the growing field of sound therapy, intuitive and shamanic healing, and the use of many traditional and modern instruments of the world, including Native American style drums, flutes, and rattles, pure quartz crystal singing bowls, didgeridoos, Tibetan bells and bowls, tuning forks, Irish flutes and whistles, Indian instruments such as sitar, tambura, tabla, and much more. 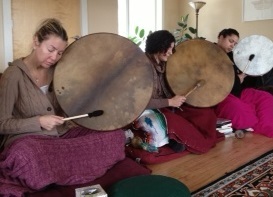 For over 40 years we have specialized in the nature of sound as a healing methodology, used throughout history by most cultures, with growing interest in clinical therapeutic and medical settings, from indigenous shamanic practices, to Tibetan and Hindu chanting, Peruvian mysticism, and we understand the principals of the sound therapies that are gaining great accreditation at this time. We are a small company and highly service-oriented. We offer our many years of expertise to help you select the right instrument for your specific needs. We are available by phone for consultation or assistance in your purchases. You can find information about our trainings here. Begun as a small craft workshop in W. Massachusetts in 1977, we have been in the Green Mountains of Southern Vermont since 1995, offering a wide selection of fine quality bamboo flutes, shakuhachi, bamboo saxophones, bamboo clarinets, Native American style flutes, and didgeridoos. We offer one of the widest selections of bamboo wind instruments available anywhere. During this time, we have broadened our selection of indigenous drums, simple percussive, modern concert and world musical instruments at very reasonable prices. Our traditional native-made drums have excellent craftsmanship, voice, and durability. We have authentic Australian Aboriginal and modern style didgeridoos. You will find our premiere cedar Native American style "Love" flutes on our Native American Style Flute pages, and bamboo and cedar shakuhachi and transverse flutes made in our own shop. We are the creators of the bamboo saxophone, first made in the early 1980's. Educators will want to know about our unique and highly praised, student enriching, multi-cultural Music Education Programs. We have become one of the premier online resources in the field of sound healing, and the authentic use of these instruments in therapeutic application for personal, professional and clinical application. We have one to three year trainings available in the field of sound healing and human consciousness development. Zacciah Blackburn is our founder and owner, resident therapist, sound educator and flute maker. Zacciah is Director of Education for the International Sound Healing Network, and has extensive ability to help with instruments typical to the therapeutic sound healing profession. We have other qualified assistants on staff to help with your selection, and have had a number of dedicated individuals help us through the years with preparation and finish work, exhibitions, office administration and shipping, and are grateful to their dedication and service in creating and building this practice. Zacciah was guided at an early age to change his life to a more spiritually based existence. In the mid 70's he was introduced to the bamboo flute and migrated to the beautiful mountains of New England. He immediately loved the rich, soothing qualities of the flute, and eventually began making them to give his friends and neighbors. The demand for his work grew, as did his love of flutemaking, and he was introduced to other bamboo wind instruments from around the world. 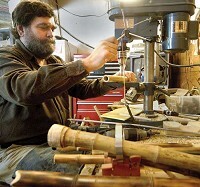 Over the years, Zacciah developed his unique style of craftsmanship, created the bamboo saxophone, and exhibited his work at major fine art, craft and music festivals and galleries across the nation. He has won numerous awards for his work. But, moreso, through those years, he was exposed to more and more world music tradtions, and the ways other cultures use music and sound healing to enhance deep meditative states, enrich one's life with rich connection, communion, and appreciation for Nature and the nature of the Living Cosmos, as well as creating extraordinary states of wellness and healing. He gathered knowledge and experiential skills with master teachers, musicians, and elders of Native American, African, Hindu, Tibetan, Cabbalistic, and other wisdom based traditions, as well as contemporary holistic modalities. He integrated this into a therapeutic sound healing practice, and over the years has created professional skill development and educational programs through our sister organization, the Center of Light. You can view more about this work through these pages, as well as the Center of Light web site. Perhaps Zacciah's greatest reward has been the overwhelmingly positive responses we get from you. Thank you. It is a blessing to be able to provide you with unique, quality instruments of the world, derived from our deep love of each instrument, and commitment to the cultural and spiritual heritage which each reflects, and which we, through this work, have been so connected to. May your musical and life journey be a rich one.